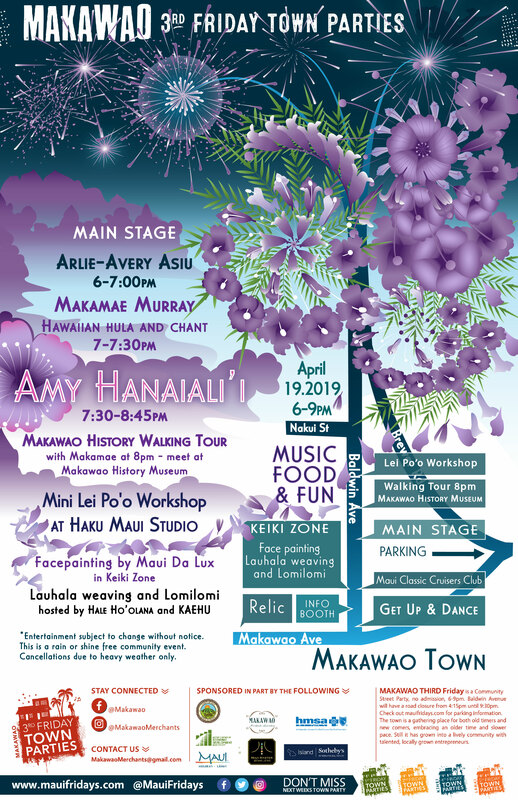 The Makawao Third Friday Town Party “Jacaranda Season” will feature Grammy award nominee Amy Hānaialiʻi Friday, April 19, 2019 from 6 to 9 p.m. in Historic Makawao Town. 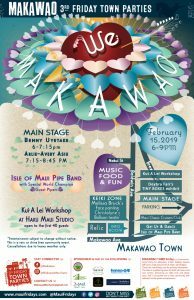 The Makawao Third Friday Town Party “Jacaranda Season” will be held in Historic Makawao Town on Friday, April 19, 2019 from 6 to 9 p.m. PC: Maui Friday Town Parties. Baldwin Avenue will be closed from the top of Makawao Avenue down to Brewer Street beginning at 5:15 p.m. Guests joining the town party can enjoy free entertainment, food trucks and booths, arts and crafts and plenty of great local shopping and restaurants. On the main stage, Arlie-Avery Asiu will perform from 6 to 7 p.m., Makamae Murray will be performing Hawaiian hula and chant from 7 to 7:30 p.m., and Amy Hānaialiʻi will perform from 7:30 to 8:45 p.m.
Makamae Murray will be leading a Makawao History Walking Tour starting at the Makawao History Museum at 8 p.m.
Local nonprofit KAEHU will be providing Lomilomi and Lauhala Keiki Arts & Crafts in the keiki zone. 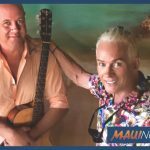 Artist Relic will perform at the Maui Hands parking lot across from Casanova Restaurant. Maui line dance group Get Up and Dance will perform from 6:45 to 7:30 p.m.
Christalyne’s Ballloon Twistin’ will provide inflatable balloon art for keiki. The Maui Classic Cruisers Club will be showing off their hot rods, muscle cars, and vintage machines at the top of Baldwin Avenue to the bottom by Brewer Road. Guests can talk story with some of Maui’s vintage car owners, aunties, uncles and Makawao historians. A free lei making workshop at Haku Maui studio will also be available for the first 30 guests. For more information about this event or the Maui Friday Town Parties, visit https://mauifridays.com/makawao/.